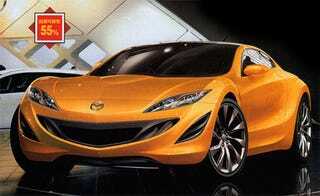 Mazda RX-7 Concept To Appear In Tokyo? Every year we hear of a new rumor involving Mazda's long departed RX-7 making a zombie-like comeback, but we've now hearing we should expect a new 1.6-liter rotary RX-7 concept for the Tokyo Motor Show. Mazda's continued development of the rotary engine will likely spawn a larger displacement version that could provide an RX-7 driver with something not synonymous with the rotary engine and something completely lacking in the 4-door RX-8 — torque. Best Car provided us with their rendition of the new RX-7, betting on Mazda continuing with their current 'Nagare' design theme that's most recently made its way onto the new Mazda3. Are these rumors any more substantial than any of the other rumors we've seen? We'll put it this way — we'll believe it when we see it.